6 Which Nutrients Best Support Healthy Vision? Visionex keeps your eyes strong and focused by providing nutrients essential for eye health and antioxidants that help fight off damaging free radicals. 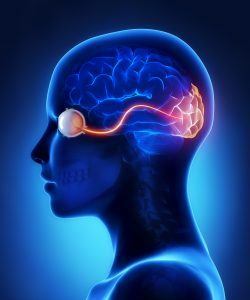 The central nervous system is composed of the brain, spinal cord, peripheral nerves, and other structures that help us perceive the world around us, including our eyes. The human eye, together with our brain and nervous system, allows us to process images of our external world. The eye is particularly prone to photo- and oxidative-damage from light, exposure to environmental factors, and its high metabolic rate. To help protect it from damage, the eye has the ability to selectively concentrate nutrients. Nutrients that support eye health include vitamin C, zinc, lutein, zeaxanthin, and certain phytonutrients. Our bodies cannot make these nutrients and so we must obtain them from the diet or a nutritional supplement. 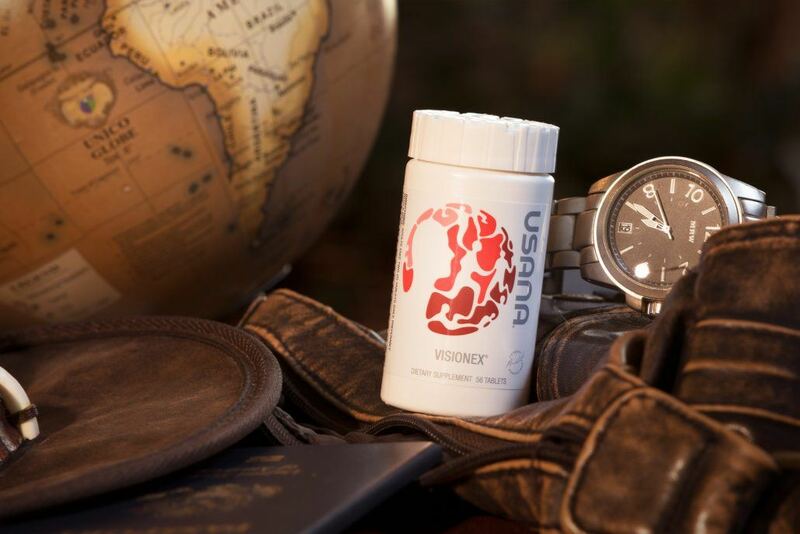 USANA’s Visionex is formulated with lutein, zeaxanthin, vitamin C, zinc, and bilberry extract to specifically support eye health. Emerging research indicates that many of these nutrients—especially lutein and zeaxanthin—have additional health benefits for brain and skin health. The central nervous system (CNS) consists of the brain, spinal cord, peripheral nerves, and other structures that coordinate and influence the activity of all parts of our body. Our eyes are considered part of the CNS because many parts of the eye actually begin as brain tissue during early embryonic development. Additionally, it takes many nerves and our brain to be able to perceive the light our eyes are taking in as physical objects. The fact that the eyes are part of the CNS is important because all structures of the CNS are protected by something known as the blood-brain-barrier or BBB. The BBB consists of a highly selective, semi-permeable membrane that separates the circulating blood from the fluids and structures of the CNS. The BBB is formed by especially tight connections between the cells that line blood vessels in and around the CNS. The BBB functions to protect these very delicate structures. To do so, it selectively allows only a few select molecules, nutrients, and chemicals to pass, either by passive diffusion or selective transport. Water is an example of a molecule that can passively cross the BBB and larger molecules like glucose, amino acids, fats, and other nutrients that are essential to brain, neuronal, and eye function are selectively and actively transported. Therefore, not all nutrients make it to the CNS. Thus, to get nutrients into the brain, neurons, and the eye, we must selectively target nutritional interventions to compounds known to cross the BBB. The human eye detects radiation (or light) in a specific part of the spectrum we refer to as visible light. The normal human eye is capable of detecting an almost countless variety of colors within this spectrum. Our eyes can form images of objects either directly in front of us or as far as many miles away. 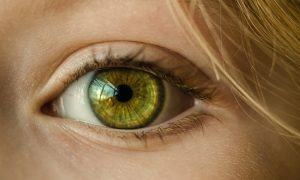 Our eyes are so sensitive they can respond to a single photon of light. They can do this because of the high concentration of sensory receptors found in the eye. 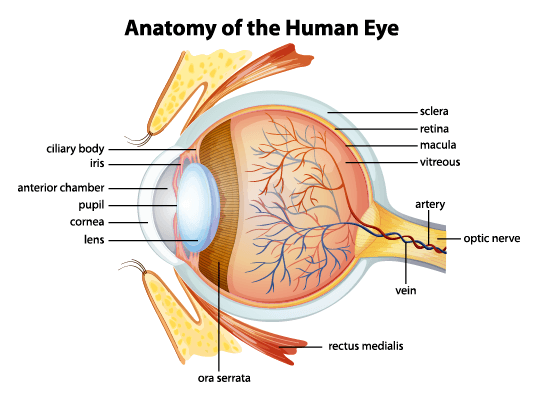 In fact, our eyes contain over 70% of all sensory receptors in the body. But the eye is only collecting and focusing light. It takes our brain to actually translate the messages the eye is perceiving to be able to “see” the world around us. Thus, to understand vision we must talk about how the eye, brain, and optic nerves all work together to visually interpret the world around us. What we actually see are the patterns of light that strike the retina—a light-sensitive layer of cells at the back of the eye. In the center of the retina is the macula. The macula is where light is most focused and visual acuity, highest. Processing of visual information begins in the retina and macula. When light is focused through its lenses on these portions of the eye it triggers specific receptors to begin to fire. Depending on the specific color of light, or whether it is day or night, specific receptors initiate a cell-signaling cascade to occur. It is these cell signaling pathways that transmit signals from the eyes, through the optic nerves, and to the primary visual cortex of the brain, located at the very back of our head, that ultimately lead to us perceiving objects in the world around us. The eye, especially the retina and even more so the macula, is particularly prone to photo- and oxidative-damage. This damage can occur from natural sunlight, artificial light from light bulbs or computer screens, exposure to environmental factors, and oxidants produced as a result of the high metabolic rate of the eye. Over time these insults add up and there is a general decline in visual acuity as we age. Of particular concern are the environmental factors that come in contact with the eye and the damaging rays that enter the eye. Just like high-intensity light (UV radiation) from the sun can burn and damage our skin, these same rays can also damage structures of the eye. If you think about it, it is an interesting dilemma the eye has to balance. On one hand, it needs to let light in so we can see. But on the other hand, it has to minimize how much light is let in to help reduce damage to the eye. To help the eye combat the harmful effects of environmental factors and light it has developed an interesting mechanism of concentrating specific nutrients to help minimize this damage. Some of these nutrients include flavonoids, vitamin C, zinc, lutein, and zeaxanthin. Flavonoids and vitamin C help promote healthy blood vessels to ensure nutrient delivery. Vitamin C and zinc work together to provide antioxidant protection. Zinc additionally helps to transport vitamin A, an essential nutrient for vision, into the eye. The central portion of the macula—the portion of the retina where most light is focused—contains a dense yellow pigment called macular pigment. Macular pigment helps protect the sensitive receptors in the macula from the potentially harmful effects of high-intensity, shorter wavelengths of light (also referred to as blue light). The nutrients that make up this macular pigment are the carotenoids, lutein, and zeaxanthin. Carotenoids make up a very large family of over 750 naturally occurring plant pigments. They are the compounds in fruits and vegetables that tend to give them their red, orange, and yellow color. What is so interesting is that with all the different carotenoids found in nature, the eye has developed the ability to specifically and selectively concentrate lutein and zeaxanthin in the eye, specific neurons involved in vision, and certain regions of the brain. Together with these other nutrients, the eye is well equipped to cope with the daily stresses. Because our bodies cannot synthesize lutein, zeaxanthin, vitamin C, zinc, and flavonoids, they must be obtained from the diet or a nutritional supplement. Research has shown that levels of these eye-protecting nutrients correlate to the amounts we consume. Levels of these nutrients begin to increase in as short as a few days and continue to increase as long as they are being consumed. Unfortunately, once consumption of these nutrients stops, levels begin to decline as rapidly as they increased. Therefore, it is important to consistently eat a healthy diet and take a nutritional supplement that supports eye health. Macular pigment includes the carotenoids lutein and zeaxanthin, an isomer of lutein, which protect eye health in two ways: first as filters that absorb some of the high-energy blue light and, second, as antioxidants that combat light-induced free radicals and other oxidants. The study involved 3640 subjects, ages 55-80. The subjects in the test group were administered daily amounts of 500 mg vitamin C, 400 IU vitamin E, 15 mg beta-carotene (25,000 IU vitamin A equivalents), and 80 mg zinc. The results showed that supplementation slowed AMD by 25% and visual acuity loss by 19% in high-risk individuals. These results have since been confirmed in several smaller studies. In the years since the original AREDS study, new research has also shown beneficial results from lutein, zeaxanthin, and the omega-3 fatty acids EPA (eicosapentaenoic acid) and DHA (docosahexaenoic acid). Read more about the health benefits of Omega-3 fatty acids here. Another landmark study was the Lutein Antioxidant Supplement Study (LAST) published in the journal Optometry. The results of this study showed that AMD symptoms might be improved through purified lutein supplementation or a supplement mix of lutein and other antioxidants such as vitamin A, vitamin C, vitamin E, and beta-carotene. The dosage of lutein and zeaxanthin used in the study were 10 mg and 2 mg, respectively. More recent studies have shown that nutritional interventions can not only reduce the risk for diseases of the eye but also help support vision in general. For example, Stringham JM, and Hammond BR performed a study on 40 young, healthy subjects with an average age of 23.9. They were assigned to receive daily supplements of lutein (10 mg) and zeaxanthin (2 mg) for six months. The subjects’ eyes were then tested for the effects of glare as experienced in everyday situations, including being outdoors on bright days, lengthy sessions of looking at a computer monitor, and nighttime exposure to oncoming headlights. Following six months of supplementation, the participant’s average macular pigment optical density (MPOD) increased significantly from the average value at the beginning of the study. Higher MPOD has been linked to increased visual acuity. After testing the subjects for their performance in visual tasks researchers concluded that four to six months of supplementation with lutein and zeaxanthin significantly improved visual performance in high glare situations. AREDS 2, which was published in 2013, tested several variations of the original formula. One was using lutein/zeaxanthin instead of beta-carotene, one included fish oil, and one included a significantly reduced zinc level (25 mg). Removing the beta-carotene did not affect the outcomes, so it concluded that lutein and zeaxanthin were safe and effective alternatives to beta-carotene. 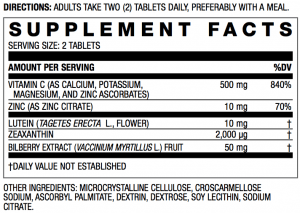 The reduced zinc level (25 mg) was just as effective as the high zinc formula. Adding EPA and DHA (omega 3 fatty acids) did not provide any additional benefit in reducing AMD progression. So, based on the actual results of the study, it would make sense to use lutein and zeaxanthin in place of beta-carotene, healthy zinc levels, maintain the same or similar levels of vitamins C and E and copper. The last study involved more than 100,000 participants from the Nurses’ Health Study and the Health Professionals Follow-up Study. All participants were aged 50 years or older and were free of diagnosed AMD, diabetes mellitus, cardiovascular disease, and cancer (except non-melanoma skin cancer) at baseline. The researchers analyzed carotenoid intake based on dietary food frequency questionnaires at baseline and follow-up, and then calculated predicted plasma carotenoid scores. The results of this study found that participants with the highest average plasma lutein and zeaxanthin levels had a 40% reduced risk of developing advanced AMD compared to those with the lowest average levels. The authors concluded “lutein and zeaxanthin form macular pigments that may protect against AMD by reducing oxidative stress, absorbing blue light, and stabilizing cell membranes,” the authors explain. Which Nutrients Best Support Healthy Vision? Vitamin C is an antioxidant found in fruits and vegetables. 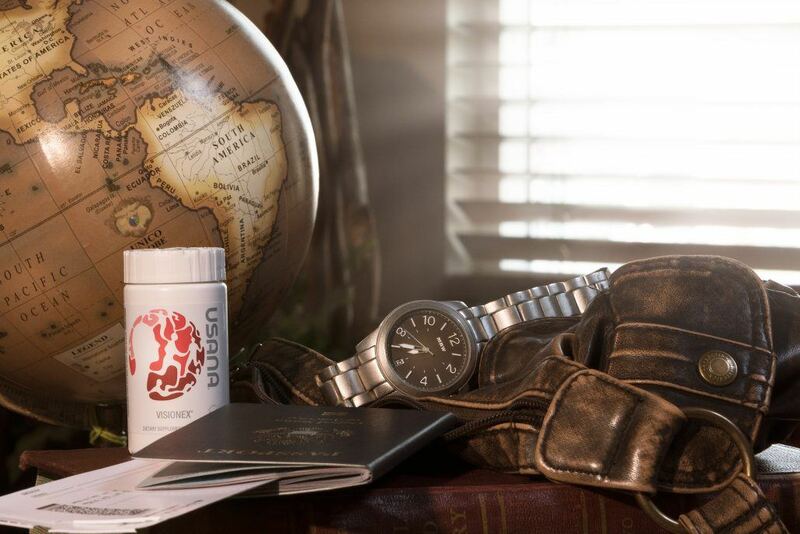 It supports healthy capillaries, gums, teeth, and cartilage. Vitamin C can be found in virtually every cell in the body, and its concentration is significantly higher in the retina than in the blood. Since the human body does not make vitamin C, it must be consumed as part of the diet. Zinc is a trace mineral that is found in high concentrations in the eye. It plays a critical role in transporting vitamin A to the retina. Zinc deficiency has been linked to poor night vision and cloudy cataracts. Zinc appears to provide an additive effect of antioxidant protection and helping to promote good visual acuity. Lutein and zeaxanthin are carotenoids that are selectively transported across the BBB and deposited in the macula of the eye. They serve as antioxidants, which help to neutralize free radicals and reduce oxidative stress. Additionally, they serve to help filter out and reduce the damaging effects of high-energy blue light thus also helping to improve visual acuity. The bilberry fruit is rich in antioxidant anthocyanosides and has been shown to help retain healthy capillaries, including those in the eye and by helping to support the retina. This is especially important to help support eye health but also to deliver nutrients to this highly metabolically active tissue. 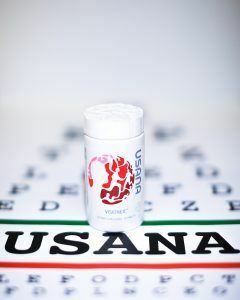 New and recent research has shown that many of the ingredients in USANA’s Visionex formula have additional health benefits outside of the eyes. As mentioned above, Flavonoids and vitamin C help promote healthy blood vessels. Vitamin C and zinc work together to provide antioxidant protection. Zinc additionally helps to transport vitamin A into the eye. The central portion of the macula—the portion of the retina where most light is focused—contains a dense yellow pigment called macular pigment. Macular pigment helps protect the sensitive receptors in the macula from the potentially harmful effects of high-intensity, shorter-wavelengths of light (also referred to as blue light). Obviously, these nutrients will have similar health benefits throughout the body but some of the most exciting research centers around lutein and zeaxanthin. Lutein and zeaxanthin accumulate throughout the body. They concentrate in tissues, organs, bones, and become especially concentrated in the skin and specific regions in the brain. And now the links between many outcomes of skin health, brain/cognitive function, a healthy cardiovascular system, and additional measures of eye health have also been identified. And not only in adults but many of these effects are observed in infants, children, elite athletes, adults, and the elderly. First is their ability to act as antioxidants, helping protect against damaging oxidative stress in lipid membranes of all tissues they are found in including essential lipid-based particles that float around our blood stream and are responsible for cardiovascular health. The leading hypotheses for why lutein and zeaxanthin have such wide-ranging effects centers around three key properties of their molecular structures. First is their ability to act as antioxidants, helping protect against damaging oxidative stress in lipid membranes of all tissues they are found in including essential lipid-based particles that float around our blood stream and are responsible for cardiovascular health. Second, the same reason lutein and zeaxathin protect the retina and macula from sunlight also protects other tissues exposed to the sun especially the skin. For example, when the skin becomes rich in carotenoids including lutein and zeaxanthin, they yield the equivalent of an SPF (sun protecting factor) of around six-eight. Lastly, in regards to brain health, a couple factors likely come into play. As mentioned above, not only can lutein and zeaxanthin cross the BBB and get deposited in the eye but they also now have been shown to be deposited in other regions of the brain. But what can account for such a broad range of cognitive effects? Two aspects are likely responsible. Both relate to increasing the speed and efficiency of sending signal through neurons. The first proposed mechanism that may be occurring is an improved speed at which signals are sent down a neuron. This may be the result of their antioxidant properties and helping to “shuttle” electrons or other neural signals down a neuron. The second hypothesis is that lutein and zeaxanthin are working through cell signaling pathways to turn on specific genes. What has been shown tis that lutein and zeaxanthin activate specific cell signaling pathways that turn on a gene that is responsible for holding—especially neurons—tightly against each other through what are known as tight junctions. Think of these tight junctions as glue that keeps the cells in close connection. The more glue the stronger and tighter the connection. Why would this be important? Neurons need to send messages not only down the length of their cells but also communicate between cells. The better these connections, the more efficient the signal is both sent and received. Increased signaling efficiency equals the faster a message is sent. By also increasing the amount of this cellular glue, may help neurons in the brain better form new connections—something very important for learning and memory. As a result indices of brain function such as learning, memory, verbal fluency, learned knowledge and experience, reaction time, balance, neural efficiency (processing speed), and many measures of cognitive performance have been shown to improve in individuals with the highest levels of circulating carotenoids and specifically lutein and zeaxanthin. While the roles lutein and zeaxanthin play in the physiology of all of these tissues are not completely known, the links between lutein and overall health are so strong that several national and regional health organizations have recommended the increase of dietary lutein. Despite the overwhelming evidence of increasing overall carotenoid consumption including lutein and zeaxanthin on overall health. It has been shown that both adult’s and children’s diets are significantly deficient. Thus, the majority of the population could benefit from increasing amounts being consumed either through a healthy diet and/or through nutritional supplementation. Richer S. et al. Double-masked, placebo-controlled, randomized trial of lutein and antioxidant supplementation in the intervention of atrophic age-related macular degeneration: the Veterans LAST study (Lutein Antioxidant Supplementation Trial). Optometry. 2004 Apr;75(4):216-30. Stringham JM, Hammond BR. Macular pigment and visual performance under glare conditions. Optometry and vision science : official publication of the American Academy of Optometry. 2008;85(2):82-8. Age-Related Eye Disease Study Research Group. A randomized, placebo-controlled, clinical trial of high-dose supplementation with vitamins C and E, beta-carotene, and zinc for age-related macular de- generation and vision loss: AREDS report no. 8. 2001. Arch Ophthalmol 119(10):1417-36. Canter PH, Ernst E. Anthocyanosides of Vaccinium myrtillus (bilberry) for night vision–a systematic review of placebo-controlled trials. 2004. Surv Ophthalmol 49(1):38-50. Cejkova J, Stipek S, Crkovska J, Ardan T, Platenik J, Cejka C, Midelfart A. UV Rays, the prooxidant/antioxidant imbalance in the cornea and oxidative eye damage. 2004. Physiol Res 53(1):1-10. Jacques PF, Taylor A, Moeller S, Hankinson SE, Rogers G, Tung W, Ludovico J, Willett WC, Chylack LT Jr. Long-term nutrient intake and 5-year change in nuclear lens opacities. 2005. Arch Ophthalmol 123(4):517-26. Kulick KM, Hoffman CJ. Nutrition supplement usage recommendation by eye care specialists for macular degeneration of the eye: A statewide survey of Michigan. 1995. Topics in Clinical Nutrition 10(4):67-77. Larkin M. Vitamins reduce the risk of vision loss from macular degeneration. 2001. Lancet 20;358(9290):1347. Larson T, Coker J. 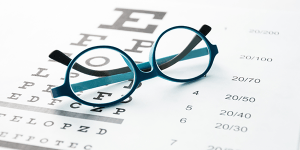 The Perceptions, Recommendations, and Educational Materials of Licensed Wisconsin Optometrists on Lutein and Zeaxanthin and Eye Health. 2007. Journal of the American Dietetic Association 107(8)S1:A103. Richer S, Stiles W, Statkute L, Pulido J, Frankowski J, Rudy D, Pei K, Tsipursky M, Nyland J. Double-masked, placebo-controlled, randomized trial of lutein and antioxidant supplementation in the intervention of atrophic age-related macular degeneration: the Veterans LAST study (Lutein Antioxidant Supplementation Trial). 2004. Optometry 75(4):216-29. Stringham JM, Hammond BR Jr. Dietary lutein and zeaxanthin: possible effects on visual function. 2005. Nutr Rev 63(2):59-64. Trieschmann M, Beatty S, Nolan JM, Hense HW, Heimes B, Austermann U, Fobker M, Pauleikhoff D. Changes in macular pigment optical density and serum concentrations of its constituent carotenoids follow- ing supplemental lutein and zeaxanthin: the LUNA study. Exp Eye Res. 2007 Apr;84(4):718-28. Epub 2006 Dec 19. Age-Related Eye Disease Study Research Group. (2001) A randomized, placebo-controlled, clinical trial of high-dose supplementation with vitamins C and E, beta carotene, and zinc for age-related macular degeneration and vision loss: AREDS report no. 8. Arch Ophthalmol 119(10):1417-36. Bialostosky, K., Wright, J. D., Kennedy-Stephenson, J., McDowell, M. & Johnson, C. L. (2002) Dietary intake of macronutrients, micronutrients, and other dietary constituents: United States 1988-94.Vital Health Stat 11, 1-158. Bovier, E. R., Renzi, L. M. & Hammond, B. R. (2014) A double-blind, placebo-controlled study on the effects of lutein and zeaxanthin on neural processing speed and efficiency. PLoS One 9, e108178. Bovier, E. R. & Hammond, B. R. (2015) A randomized placebo-controlled study on the effects of lutein and zeaxanthin on visual processing speed in young healthy subjects. Arch Biochem Biophys 572, 54-57. Canter PH, Ernst E. (2004) Anthocyanosides of Vaccinium myrtillus (bilberry) for night vision– a systematic review of placebo-controlled trials. Surv Ophthalmol 49(1):38-50. Cejkova J, Stipek S, Crkovska J, Ardan T, Platenik J, Cejka C, Midelfart A. (2004) UV Rays, the prooxidant/antioxidant imbalance in the cornea and oxidative eye damage. Physiol Res 53(1):1-10. Cheatham, C. L. & Sheppard, K. W. (2015) Synergistic Effects of Human Milk Nutrients in the Support of Infant Recognition Memory: An Observational Study. Nutrients 7, 9079-9095. Craft, N. E., Haitema, T. B., Garnett, K. M., Fitch, K. A. & Dorey, C. K. (2004) Carotenoid, tocopherol, and retinol concentrations in elderly human brain. J Nutr Health Aging 8, 156-162. Feart, C. et al. (2016) Plasma Carotenoids Are Inversely Associated With Dementia Risk in an Elderly French Cohort. J Gerontol A Biol Sci Med Sci 71, 683-688. Hammond, B. R., Jr. & Wooten, B. R. (2005) CFF thresholds: relation to macular pigment optical density. Ophthalmic Physiol Opt 25, 315-319. Jacques PF, Taylor A, Moeller S, Hankinson SE, Rogers G, Tung W, Ludovico J, Willett WC, Chylack LT Jr. (2005) Long-term nutrient intake and 5-year change in nuclear lens opacities. Arch Ophthalmol 123(4):517-26. Johnson, E. J. et al. (2013) Relationship between Serum and Brain Carotenoids, alpha-Tocopherol, and Retinol Concentrations and Cognitive Performance in the Oldest Old from the Georgia Centenarian Study. J Aging Res. 951786. Johnson, E. J. et al. (2008) Cognitive findings of an exploratory trial of docosahexaenoic acid and lutein supplementation in older women. Nutr Neurosci 11, 75-83. Kiko, T. et al. (2012) Significance of lutein in red blood cells of Alzheimer’s disease patients. J Alzheimers Dis 28, 593-600. Kulick KM, Hoffman CJ. (1995) Nutrition supplement usage recommendation by eye care specialists for macular degeneration of the eye: A statewide survey of Michigan. Topics in Clinical Nutrition 10(4):67-77. 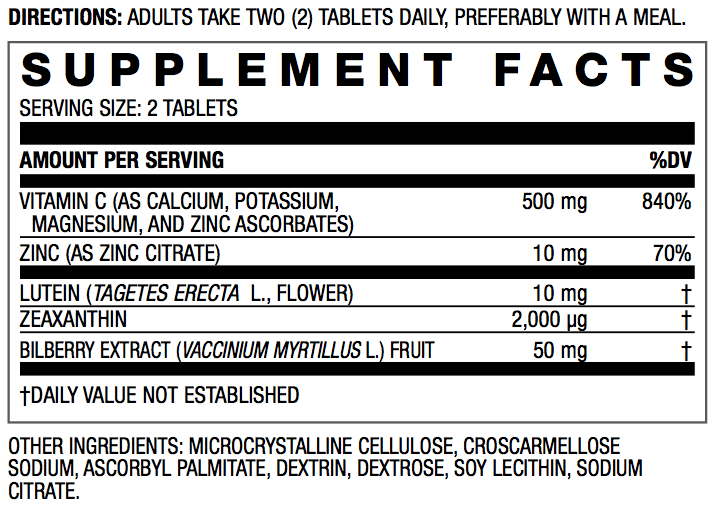 Larkin M. (2001) Vitamins reduce risk of vision loss from macular degeneration. Lancet 20;358(9290):1347. Larson T, Coker J. (2007) The Perceptions, Recommendations, and Educational Materials of Licensed Wisconsin Optometrists on Lutein and Zeaxanthin and Eye Health. Journal of the American Dietetic Association 107(8)S1:A103. Lieblein-Boff, J. C., Johnson, E. J., Kennedy, A. D., Lai, C. S. & Kuchan, M. J. (2015) Exploratory Metabolomic Analyses Reveal Compounds Correlated with Lutein Concentration in Frontal Cortex, Hippocampus, and Occipital Cortex of Human Infant Brain. PLoS One 10. Min, J. Y. & Min, K. B. (2014) Serum lycopene, lutein and zeaxanthin, and the risk of Alzheimer’s disease mortality in older adults. Dement Geriatr Cogn Disord 37, 246-256. Nolan, J. M. et al. (2014) Macular pigment, visual function, and macular disease among subjects with Alzheimer’s disease: an exploratory study. J Alzheimers Dis 42, 1191-1202. Ohno-Matsui, K. (2011) Parallel findings in age-related macular degeneration and Alzheimer’s disease. Prog Retin Eye Res 30, 217-238. Renzi, L. M., Bovier, E. R. & Hammond, B. R., Jr. (2013) A role for the macular carotenoids in visual motor response. Nutr Neurosci 16, 262-268. Renzi, L. M. & Hammond, B. R., Jr. (2010) The relation between the macular carotenoids, lutein and zeaxanthin, and temporal vision. Ophthalmic Physiol Opt 30, 351-357. Richer S, Stiles W, Statkute L, Pulido J, Frankowski J, Rudy D, Pei K, Tsipursky M, Nyland J. (2004) Double-masked, placebo-controlled, randomized trial of lutein and antioxidant supplementation in the intervention of atrophic age-related macular degeneration: the Veterans LAST study (Lutein Antioxidant Supplementation Trial). Optometry 75(4):216-29. Stringham JM, Hammond BR Jr. (2005) Dietary lutein and zeaxanthin: possible effects on visual function. Nutr Rev 63(2):59-64. Stringham JM, Hammond BR. (2008) Macular pigment and visual performance under glare conditions. Optometry and vision science : official publication of the American Academy of Optometry. 85(2):82-8. Trieschmann M, Beatty S, Nolan JM, Hense HW, Heimes B, Austermann U, Fobker M, Pauleikhoff D. (2007) Changes in macular pigment optical density and serum concentrations of its constituent carotenoids following supplemental lutein and zeaxanthin: the LUNA study. Exp Eye Res. Apr;84(4): 718-28. Vishwanathan, R., Kuchan, M. J., Sen, S. & Johnson, E. J. (2014) Lutein and preterm infants with decreased concentrations of brain carotenoids. J Pediatr Gastroenterol Nutr 59, 659-665. Wang, W., Shinto, L., Connor, W. E. & Quinn, J. F. (2008) Nutritional biomarkers in Alzheimer’s disease: the association between carotenoids, n-3 fatty acids, and dementia severity. J Alzheimers Dis 13, 31-38. Zamroziewicz, M. K. et al. (2016) Parahippocampal Cortex Mediates the Relationship between Lutein and Crystallized Intelligence in Healthy, Older Adults. Front Aging Neurosci 8, 297.